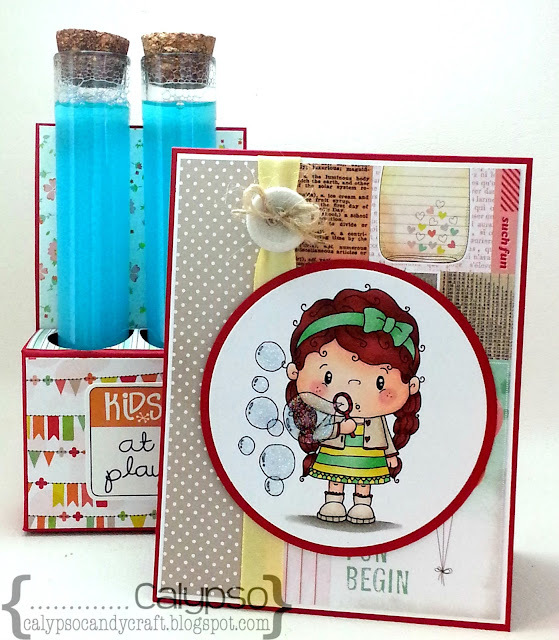 Today over at Pollycraft we have another fortnightly theme challenge for you. I had to have a little fun with the challenge. For my card today, I am using Lil Dumplings: Poppy, which is one of 6 new images new releases. They are all so freaking adorable!!! And yes, there are even a few Halloween images!!! :) The test tubes are filled with a homemade bubble recipe that Buddy and I found on Pinterest. I am always apprehensive about trying these things cause you just don't know if it will actually work. I had to try it cause, I couldn't let my little guy done. The only bad thing about the recipe was.....WAITING!!! You have to let the mix sit for an hour!!! So as you can see the bubbles are HUGE and the recipe is legitimate!!! Let it set for an hour!! So I hope you've enjoyed my project and will join us this week. Make sure to stop by the SHOP and the CHALLENGE site. You have 2 weeks to get your entries in!! Make sure you visit the challenge blog and see what the rest of the team created this week. Gorgeous creations, to get your creative gears going!! So join us this week and check out the amazing creations created by the rest if the team. What a fabulous card Calypso. Beautifully coloured image and a great design. My word but those bubbles are huge in that picture! A wonderful gift and card. The bubbles look an amazing size. Thank you for joining us at CCM this time. Such a perfect card and craft. Every child loves blowing bubbles in the summer sun! I love this image. Thanks for taking part in our current challenge at Crafty Cardmaker's! I hope you join us again next time. Soooo cute! Your colouring is gorgeous and i love all of your papers :) Thanks for joining us at Crafty Cardmakers.